Easter Island is a place of mystery that has captured the public imagination. Famous for ancient carved statues and a location so remote it boggles the mind, the island presents a captivating puzzle for researchers eager to understand how and when it became inhabited, and by whom. 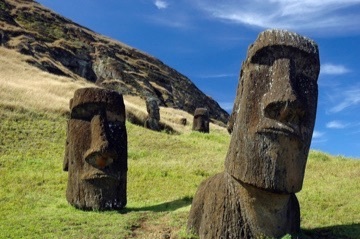 New paleogenomic research conducted by an international team led by UC Santa Cruz sheds light on those questions by ruling out the likelihood that inhabitants of Easter Island intermixed with South Americans prior to the arrival of Europeans on the island in 1722. 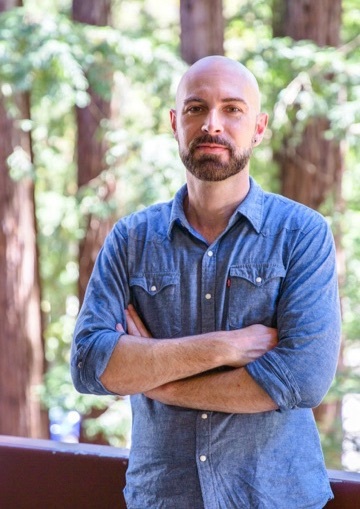 Lars Fehren-Schmitz, associate professor of anthropology at UC Santa Cruz, presents his findings in a new paper published in the Oct. 12 edition of Current Biology. The team analyzed bone fragments from the ancient skeletal remains of five individuals that were excavated in the 1980s and became part of the Kon-Tiki Museum's collection in Oslo. Each sample, which had been used in a previous study, yielded less than 200 milligrams of material. Three individuals lived prior to European contact, and two lived after. "We found no evidence of gene flow between the inhabitants of Easter Island and South America," said Fehren-Schmitz. "We were really surprised we didn't find anything. There's a lot of evidence that seems plausible, so we were convinced we would find direct evidence of pre-European contact with South America, but it wasn't there." Questions surrounding Pacific islanders' contact with South Americans are hotly debated among anthropologists. An earlier study found genetic traces of early inhabitants of the Americas in present-day indigenous residents of Easter Island. Those researchers posited that the intermixing most likely occurred between 1280 and 1425. Fehren-Schmitz was the first to use paleogenomic analysis to directly test that hypothesis; his findings indicate that contact must have taken place after 1722. Slavery, whaling, mass deportations, and other activities that followed European contact gave rise to opportunities for intermixing that likely left the genetic imprint seen in islanders today, he said. "The most likely scenario is that there wasn't a single episode," said Fehren-Schmitz. Acknowledging that his results answer one question but leave many others unanswered, he said, "The story is simply more complicated than we expected." A member of the UC Santa Cruz Paleogenomics Laboratory, Fehren-Schmitz uses DNA sequences recovered from preserved biological remains to trace molecular evolutionary processes through time. The analysis of DNA from ancient humans sheds light on human evolution, researchers' understanding of how humans diverged and interacted over time, and how the forces of culture and biology have shaped human genetic diversity. "This study highlights the value of ancient DNA to test hypotheses about past population dynamics," said Fehren-Schmitz. "We know the island's modern populations have some Native American ancestry, and now we know that early inhabitants did not. So the big questions remain: Where and when did these groups interact to change the genetic signature of Easter Islanders?" One of the mysteries of Easter Island—also called Rapa Nui—is how the island came to be populated. Located nearly 1,300 miles from the nearest inhabited island, it is 2,200 miles from central Chile on the nearest continent of South America. Some archaeologists have suggested that sea travel between Polynesia and the Americas was plausible, leading to the intermingling of those populations and perhaps even the peopling of the Americas. But plausibility isn't proof, noted Fehren-Schmitz. "We want to do more work to determine more precisely when this gene flow between Native Americans and the people of Rapa Nui occurred, and where in the Americas it originated," he said. "The population dynamics of these regions are fascinating. We need to study the ancient populations of other islands—if remains exist." This project also demonstrates the value of using recently developed research methods on materials from older museum collections. Tropical conditions make preservation difficult, and rib fragments are generally too soft to be desirable, but recent technological advances opened up new possibilities, said Fehren-Schmitz. "Our methodologies have evolved so much in the last five years that we might need to re-study samples we gave up on in the past to see if we can get DNA out of them," he added. Co-authors on the paper include Catrine Jarman at University of Bristol; Kelly Harkins at UC Santa Cruz; Manfred Kayser at University Medical Center Rotterdam; Brian Popp at University of Hawaii; and Pontus Skoglund at Harvard Medical School.